The University of Wyoming’s Energy Innovation Center (EIC) opened in December 2012 to support the University of Wyoming (UW) and the School of Energy Resources (SER) in achieving the mission of positioning Wyoming as a global leader in energy education, research and outreach. This state-of-the-art research and collaboration facility, located on the northwest corner of UW’s Laramie campus, includes technical research space, offices, a classroom, and meeting spaces. Modern, reconfigurable laboratory spaces play a key role in advancing our strategic plan. The design and construction of the EIC was made possible through private donations and State of Wyoming matching funds. Generous private donations were also given by Encana, BP, Shell, Peabody Energy, Arch Coal, Marathon Oil, Questar, and ConocoPhillips. The EIC provides students, researchers, and academic professionals the opportunity to actively engage in, observe, and support advancements in sustainable energy technologies. The Energy Innovation Center has rooms available for reservation. Room reservations are open Monday-Friday during regular business hours for non-SER associated groups. SER does not provide event staffing or catering and drink services. All reserving parties are responsible for clean up of the space. Click on the links below to learn more about each room and complete a room reservation form. Tours of the EIC are available upon request. Tours can accommodate up to 30 people per tour and typically last about 20 to 25 minutes. The tour will take guests throughout the building to learn more about the laboratory spaces within the building and current energy research being conducted by UW faculty and research scientists. Tours are available during normal business hours Monday-Friday. Click here to request a tour of the Energy Innovation Center. The School of Energy Resources (SER) reserves the right to cancel, postpone or reschedule an event at any time due to unforeseen circumstances. SER will make its best attempt to accommodate groups if problems arise. 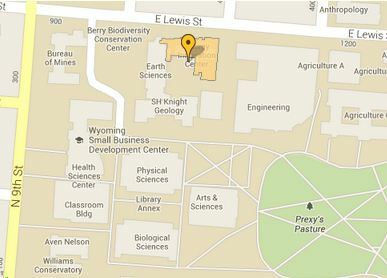 Groups comprised of University of Wyoming faculty, staff and/or research scientists are given primary access to spaces available for reservation with the Energy Innovation Center followed by outside entities. For detailed policies regarding the use of UW facilities, please click here.